The combination of cocoa and chili has always intrigued me, at first it seemed like such a random combination that I couldn’t imagine that flavor it produced. The first time I heard of this combination was during an episode of Iron Chef America in which Bobby Flay uses the combination of cocoa and chili, then when I was in Mexico earlier this year, I took the plunge and tried a mole sauce (pronounced moh-lay) which is a sauce often used in Mexican cuisine. This sauce can be a mixture of chiles, tomatoes, spices such as cumin, cinnamon and lastly, chocolate. I stumbled upon this recipe for Cocoa and Chili Rubbed Pork the other day and I knew it was something I had to make right away. Unfortunately, the pork chops that had been in my fridge went bad, so I had to wait a few days later until we got some new pork chops. Woops, bad planning. 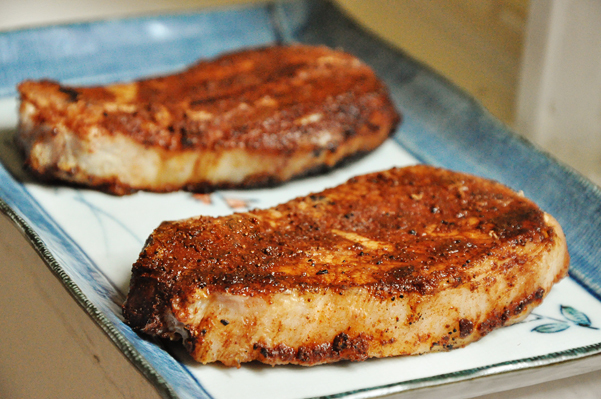 But, I’ll tell you, these cocoa and chili rubbed pork chops were by far worth the wait. I’m not usually a fan of pork chops, but these were so easy to prepare and they cooked on the grill quickly, and were so juicy and tasty that I don’t think I’ll ever eat pork chops another way again. To prepare the pork, brine chops in 1 quart of water, 1 tsp salt and 1 tsp pepper for an hour in the fridge. In a small bowl, combine chili powders, brown sugar, cocoa powder and coffee. Remove chops from brine, and sprinkle half the spice blend on one side of all the chops, lightly patting it in before flipped over and sprinkling the remaining half of the spice blend on the chops and lightly patting it in. Heat grill to medium and cook chops for 4 minutes on one side with the top down, before flipping and cooking an additional 5 minutes or until meat reaches 160 degrees. Note: Cooking time may vary due to thickness of pork chops, my chops were not very thick so adjust cooking time as necessary. These pork chops were spicy and one of my favourite meals thus far this summer. Get grilling tonight and make some of these pork chops, they pair perfectly with my Nana’s Coleslaw. Yum, these chops look terrific! Definitely need to give it a try, I love finding new ways to prepare pork chops. This sound awesome! I'm putting these on my list of things to make soon! I've made these pork chops twice now, and they are AMAZING! Thanks so much for sharing this recipe! Yum - these were really good! At first I was like, "Cocoa and Pork??" but it really is quite good. My husband loved and I wasn't sure he would but I didn't tell him what the ingredients were - he just said it was great and would love to see it more often!! lol I guess some things do mix that do not seem like they would.